And so we come to the final day of MoFo (at least in my timezone). When I started my Robin Robertson Rocks theme, almost all of the photos had been accumulating in my folders so I had lots of material. However, I realised that there was one book from the list in my first post that I somehow had not used at all, Nut Butter Universe. So over the past week I tried to make several things from this book so I could make it my final MoFo post. I ate a lot of nut butter (particularly for sandwich snacks) in order to make this happen. The things you do for MoFo. 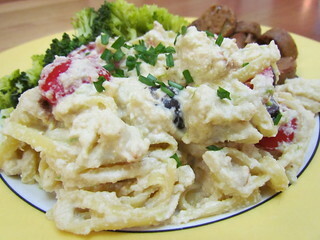 Pasta with Cauliflower-Cashew Alfredo had me at the world cauliflower. I deviated from the recipe slightly by roasting the cauliflower rather than steaming it. Because roasted cauliflower!!! The sauce is made from cashews, stock, cauliflower, non-dairy milk (the book called for almond, keeping with the nut theme, but I used oat), wine, nooch, lemon and seasonings and is creamy and tangy. I made my sauce in the food processor rather than the blender, so maybe it was not as smooth as it could have been, but the taste was still great. II used about 10oz of linguine (the recipe calls for 1lb, I got about 5 servings from my 10oz), and you also add leftover cauliflower, olives and tomatoes. I served this with broccoli and some precious Field Roast I brought back from the US. 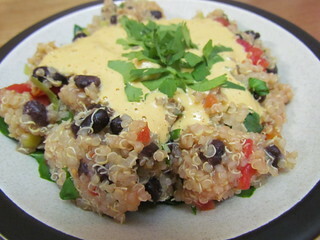 Quinoa and Black beans with Cashew Queso Sauce ticks off several of my favourite foods. The cashew queso sauce is totally amazing, I would highly recommend making a double or even triple batch so you can drown everything in it! I didn't have any pickled jalapenos, so I used a fresh green chile that I chopped. However, adding it towards the end (unlike other recipes where I have sauteed the chili) meant that it retained a bit more heat than I usual like. But the sauce was there to make it all better. Rating. :D... seriously... the sauce! 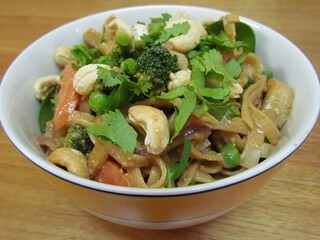 Brocolli and Rice Noodles with Hoisin-Cashew Sauce has a major error in the recipe - it makes no mention of the broccoli in either the instructions or the ingredients!! I added a head of broccoli when I was stir-frying the vegetables, as well as some peas for more green (my broccoli was pretty small) and I used sliced carrot instead of capsicum. I also added a couple of sliced and sauteed 'vegan gluten rolls' I had bought in a fit of curiosity at an Asian grocery store for some more protein. This is a sweet and rich sauce, and is great with the chewy noodles. 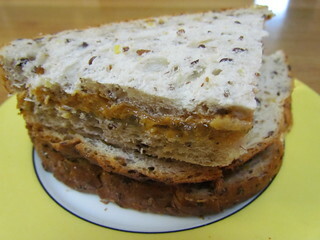 My Favourite PB&J is a pretty simple 'recipe' - bread, peanut butter, jam is nothing new. However Robin's favourite PB&J is made with lime marmalade as the jam, and this is why I like it. It is easy to get stuck into a PB&J rut, but this reminds us that there is a whole world of jam out there. I didn't have lime marmalade, but there was some mandarine marmalade open in the fridge (which I disovered is insanely sweet, normally I use fruit-juice sweetened jams but this was full of sugar). Really any jam could have a turn at being the J. 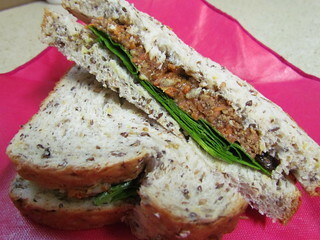 Flower Power Almond Butter Sandwich is a mix of almond butter, grated carrot, sunflower seeds, raisins and maple syrup on bread. I also added some baby spinach leaves. I found this quite sweet, so next time I would leave out the maple syrup. I took this to work to be my easy to eat lunch when I was working a half day at our bigger clinic, and it was surprisingly filling. 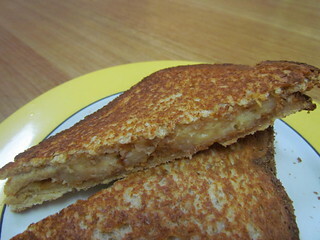 Grilled Peanut Butter and Banana Sandwich is a nice snack. I made this in my panini press rather than in a frying pan, so I didn't use any butter on the outside of the bread. The only thing is that the flavour of the peanut butter and the banana is lost a little when it is hot. I think that either some vegan bacon or some blueberries and cinnamon would be great in this. Open-Face Peanut Butter and Tomato Broil had to make the list for MoFo, given the curiosity that the PB and tomato quesadilla from Quick-Fix Vegetarian generated in the comments. I still like the combination! Though I think it is more fun in quesadilla form. 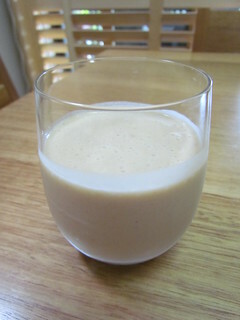 Peanut Butter and Banana Smoothie was a change of pace from my usual green smoothies. It said serves one or two, and I made a half quantity - you can see it is tiny, so I would say a full recipe would really serve one. The flavour is classic, though for me I would view it more of a snack smoothie rather than I breakfast smoothie, but that is because I really am addicted to greens in my morning smoothies. So, here ends Vegan MoFo for 2014. I am so glad I decided to participate (inspired by my upcoming trip to VidaVeganCon next year... I can't wait!!). I have had such a great time reading through everyone's blogs as well, I tried to comment as much as I could! The other great thing about participating was that it has given me my blogging buzz back again, yay! I know I won't be posting as often, but I think I will aim for a few times a week, especially now that I am in the habit of writing posts in advance to keep as drafts when I have a day off. I will be bringing you many more recipe round-ups from cookbooks, as well as stories of my recent trip to Seattle, vegan places I have been eating at and maybe something else every now and again. And, as always, cute kittens! Thanks a lot MoFoers, I love you! I hope to meet lots of you in Austin in 2015! 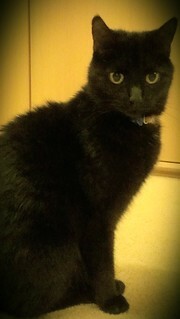 I couldn't end MoFo without posting a photo of my beautiful Gizmo. 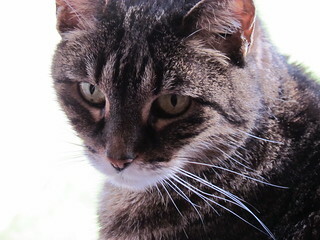 It is two and a half years since she has been gone, and I miss her every single day. 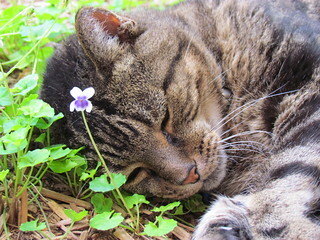 Although these days I have to say that I only have two kitties, I will always have Gizmo as well. As mentioned, I have a lot of photos stored up from lots of cooking but not much blogging, and I have been working through these as I have been doing these posts. The way I save photos on my computer is that I have a folder for each book, and I name the photo file after the page name in the book so I can clearly see where everything fits. These all go into a 'To Upload' folder within the book folder, and once they are uploaded I move them into another folder titled for the chapter they come from. Because I am mostly just uploading photos in order, I realised that I had shared almost no sweet treats with you! So I decided to delve into the desserts chapter of 1000 Vegan Recipes for my penultimate MoFo post. 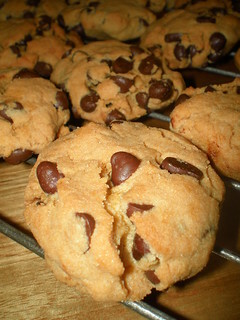 Chocolate Chip Cookies are the quintessential cookies. I had to add a bit more soy milk to the dough as it was quite dry initially, then I shaped them with my hands as it was still a bit too stiff to drop from a spoon. Maple-Walnut Oatmeal Cookies are lightly spiced and packed full of oats and walnuts, with a hefty dose of maple syrup thrown in. There is something so comforting about oat cookies, and these don't disappoint. Orange-Scented Coconut Cookies are gluten free and soy free, I made them to take to a potluck. 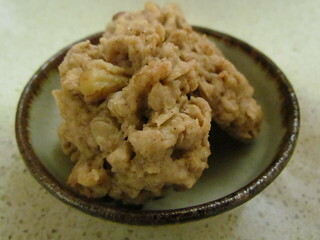 The recipe says it makes three dozen, but these are very small cookies. These were nice, but because they contain coconut oil I could only eat one. That's why I took them to a potluck, where they were quickly gobbled up. 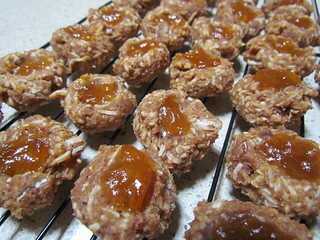 Peachy Thumbprint Cookies were a beautiful addition to an afternoon tea when I had some friends visiting. 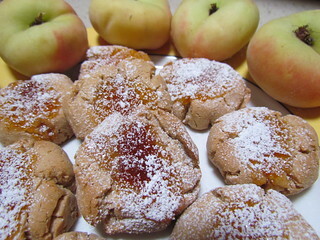 The cookies themselves are spiced with cinnamon and allspice, which goes beautifully with the peach jam in the centre. It was quite a dry dough, and I only got 11 cookies using 1 1/2 inch balls instead of two dozen like the recipe said. These are so amazing and delicious, that you may want to make a double or triple batch because you will want to eat them all. Chocolate Coconut Brownies had a few issues in the execution - they stuck like crazy to the bottom of the pan once cooled. I have no idea why I forgot to put baking paper in the pan! That aside, these were lovely. Coconut milk, extract and shredded coconut gave the coconut flavour, and there were also chocolate chips. One upside of the sticking situation was that I ended up with quite a few crumbs, which were amazing sprinkled on top of an ice cream sundae. 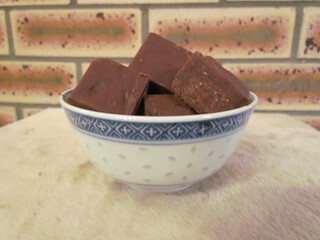 Chocolate-Peanut Butter Fudge is very intense and sweet, a decadent treat indeed. The recipe says to melt the chocolate chips and then just stir everything together, but I found it really grainy when I tried it this way so I ended up putting it all into a food processor and it turned out lovely. Chocolate-Macadamia Cheezcake Truffles are a little bit magical, using melted chocolate and cream cheese to make the thick triffle mixture. The only issue I had was with 'ground' macadamias. When I tried to process them they just turned into macadamia butter, so I ended up just crushing them with my nut mallet, so you can see they are a bit chunkier than they were probably meant to. 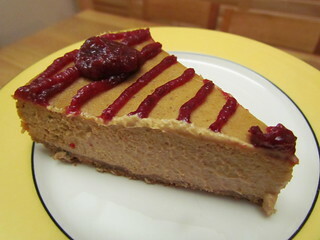 Pumpkin Cheezcake with Cranberry Drizzle should have been an autumn treat, but I made this in the middle of summer. Of course. We don't have graham crackers here, so I used digestive biscuits to make the base. The filling came together in a snap, and baked really nicely. I am always a bit worried when baking cheesecake that it won't set and will be all runny in the middle. The cranberry topping was quite thick, even though I added some more maple syrup to it. I put it in a little snaplock bag and snipped the corner off to decorate it. 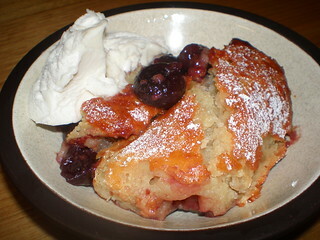 Cherry Clafoutis always sounds so great to me - cherries baked in a lovely vanilla batter, always served with some ice cream. I needed to bake it quite a bit longer to get it to set all the way through, but my oven can be a bit funny sometimes. 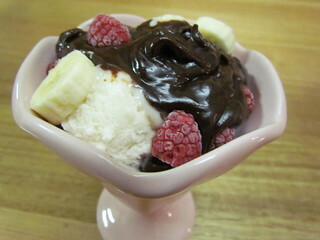 Fudgy Chocolate Sauce is thick, delicious and goes great on a sundae. Plus it comes together in a snap. Pour it over all your desserts! 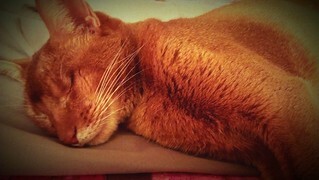 More filter fun with my phone, this time I snuck up on Sahara snoozing. I went out for lunch today at a newish vegan restaurant up in North Lakes (I will review it on the blog once MoFo is over). I ate quite a bit, so now I am in a slight afternoon food coma state. Zzzzz... So now I am reading through MoFo posts, wishing I could put myself into even a great food coma by eating all of the magical foods on all the blogs. Here is some more One Dish Vegan. 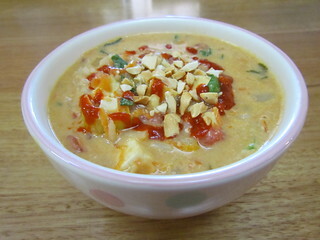 Spicy Peanut Soup is a rich, delicious filling soup. I made this for a lunch, foolishly thinking it would be a pretty light meal. Nope, this will fill you up and keep you full for a longtime, with a smile on your face. I fried the tofu in a little bit of peanut oil first before adding it to the stew at the end. This is full of onion, carrots (in lieu of red capsicum), tomatoes, rice, bok choy and tofu. I drizzled this with some sriracha. 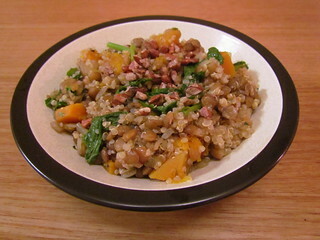 Quinoa and Lentis with Butternut Squash and Rapini came about after I finally found some real rapini for the first time. I had never seen it here before, but I had read at some point in the past that you could substitute broccolini for it (even though they really aren't the same at all now that I see rapini). But one day at the supermarket there were some big bunches of fresh rapini! Score! This is a great, earthy dish. I used pecans instead of walnuts for the topping. 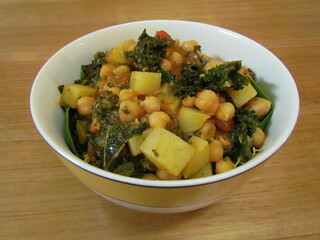 Chickpea and Kale Stew is a great winter stew, packed full of potatoes as well as the chickpeas and kale. I served this over some baby spinach leaves for even more greens. There is the option of blending a bit of the stew for some extra thickness, which I did. 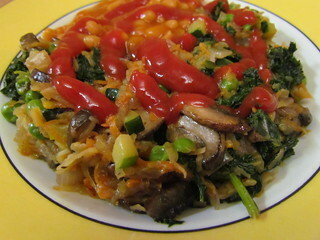 Winter Vegetable Hash is a satisfying brinner. For the vegetables I used red onion, carrot, potato, zucchini (instead of capscium), mushrooms and I also added some kale for extra greens. I had to cook this a fair bit to get it lightly browned and crispy. I got three servings out of this, rather than four, and that was served with some baked beans (just from a tin) and some toast. 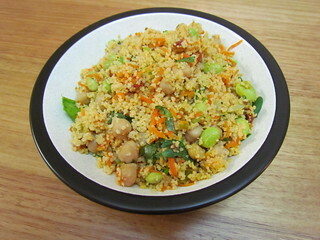 Couscous with Edamame and Chickpeas is a fun pilaf with carrot, scallions and tomatoes also included. Topped with cilantro. This made about 3.5 serves rather than 4, and was maybe a little bit dry. But it is great when topped with lots of nooch. Frittata Puttanesca caught my eye because... putanesca! 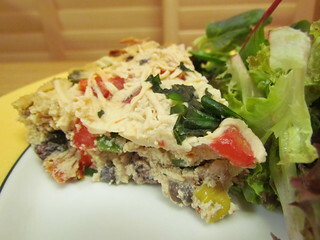 This frittata is based on firm tofu mixed up with lots of herbs, spices, nooch, olives, mushrooms and tomatoes. I topped this with some Cheezly cheese for melty goodness. 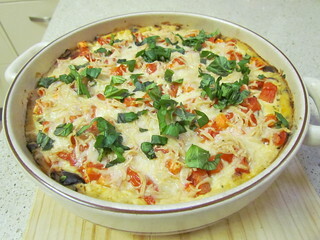 The recipe says to take out of the oven, sprinkle with fresh basil, cut into wedges and serve hot. 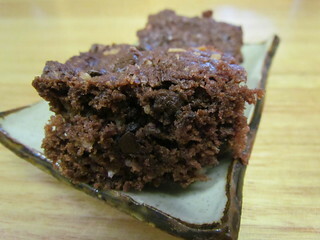 You can see from the second photo down that when I did this it was very crumbly. 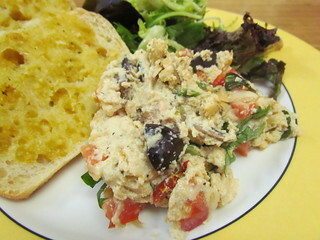 It was still super yummy, especially served with some garlic bread and salad. I chilled the leftovers in the fridge, and you can see in the third photo down that after chilling it slices much better, and keeps the shape when you reheat it. 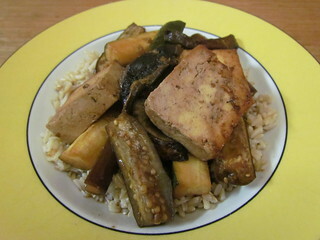 Japanese Eggplant and Tofu may not look the prettiest, but teriyaki doesn't need to look pretty! I totally screwed this up when I first made it, I couldn't work out why the sauce was so vinegary, then realised afterwards that I had left out the agave. Ooops! But then I added some agave to the leftovers and that balanced out the teriyaki beautifully. I used some portobello caps instead of the capsicum. I needed to make a triple batch of the marinade to coat everything properly. Don't be a dope! Rememeber the agave. 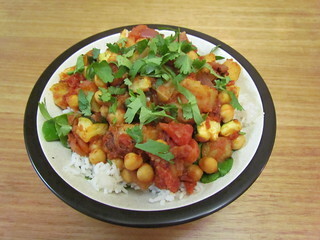 Oven-Baked Indian Vegetables with Chickpeas is lovely. The baked flavour of the vegetables blends beautifully with the precious fire-roasted tomatoes. Every part of this recipe is roasted in the oven, including the chickpeas. Yum! 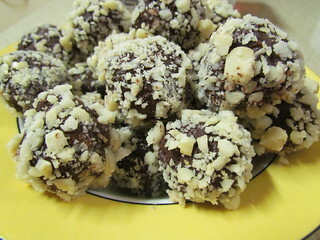 A few people have been impressed the number of recipes I am putting up in each post. I am here to share my secret, which will probably result in less awe once the truth comes out. Every time I cook I make something different out of one of my books, I almost never make the same thing twice. Too many books, too little time! I take a photo of each dish and make notes for the recipe. Then, and this is the tricky part, I don't blog for ages, while continuing to accumulate photos. This is key for having a zillion photos at your disposal. Finally, decide to do MoFo at the last minute. Because you have so many Robin Robertson books with photos awaiting their time to shine, make this your theme. So really, being such a slack blogger over the past ever has allowed me to have so many photos on hand to have a really great MoFo! And I will still have hundreds of photos left to upload here even after MoFo finishes! 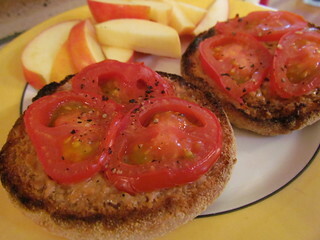 With that in mind, how about some more from Quick-Fix Vegan. 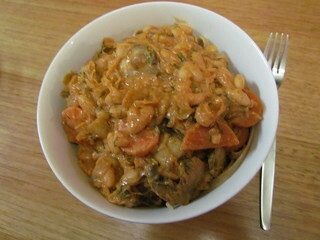 White Beans with Mushrooms and Sauerkraut was a great dinner for a cold winter night. My dad is a bit iffy about sauerkraut, however in this recipe it is drained and rinsed so he was on board. The recipe calls for one tablespoon of minced fresh dill, which is adorable. I put in about a truckload because I love dill. This makes big servings. Seitan Donburi with Unagi Sauce is amazingly delicious. The sauce includes soy and sake (there is an option to use mirin instead, but I went with sake). 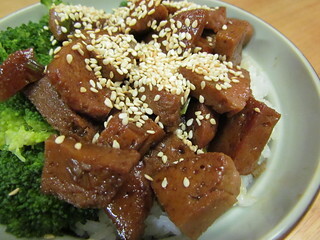 If you have some seitan on hand, this is a great recipe that comes together in a snap. This is served over rice, and I chose short grain Japanese rice, and also some broccoli on the side. Yum. 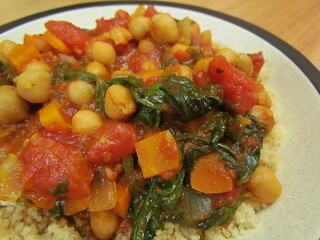 Moroccan Chickpeas with Tomatoes and Spinach is a lovely spiced dish that goes great served over couscous. I didn't have Moroccan spice blend, but the book includes a recipe to make up the perfect amount required with spices that I already had at home. I used carrot instead of capsicum. 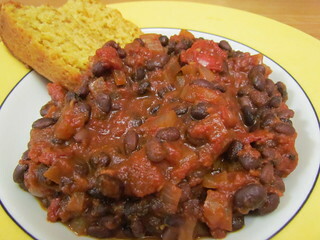 Smoky Chiptole-Chocolate Chili is a lovely deep flavour that is wonderful served with cornbread. I went easy on the chili powder as our chili powder is much hotter and also to suit my desire for just a gentle heat. 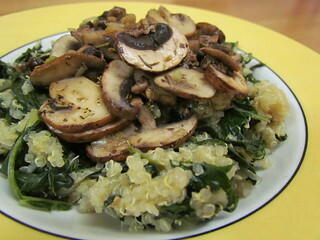 Quinoa and Chard with Sherry-Glazed Mushrooms takes two classec grains and greens and combines with lovely sherry-cooked mushrooms. You do need to keep an eye on the quinoa when you add the silverbeet to cook down, mine started catching on the bottom of the pan a little. 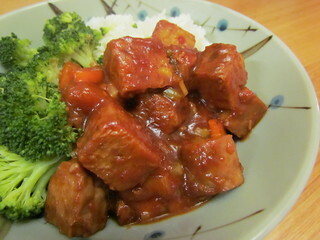 Sweet and Spicy Tempeh impressed me with the lovely sauce, not too sweet but just right. I added some carrot instead of capsicum that I cooked with the tempeh. The spicy comes from sriracha, which added a lovely mild heat. 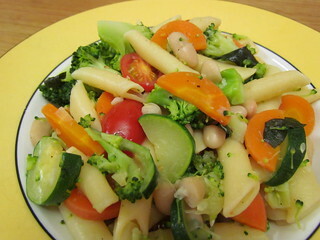 One-Pot Pasta Primavera had lots of great vegetables, most of which are cooked in the boiling water towards the end of the pasta cooking time. Despite this, they are not mushy. I added some white beans as well to make it a complete meal. It went great with nooch. Penne with Artichokes, Walnuts, and Olives was a bit dry. 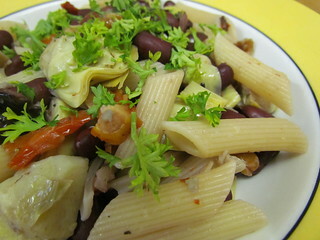 I used 8oz of penne instead of 12oz, which gave three servings, and I added a tin of kidney beans for some protein. Rotini with 10-Minute Tomato-Olive Sauce shows how easy it is to make a delicious sauce from scratch. I altered the sauce a bit, using only a 14oz tin of crushed tomatoes instead of a 28oz tin, and I didn't drain the tin of diced tomatoes. I added some kidney beans as well. I used 8oz of rotini, which gave three servings. 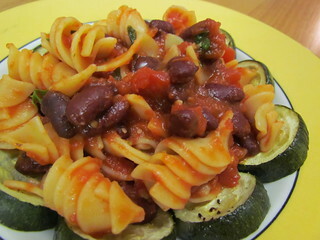 I served this with some roasted zucchini, apparently I was feeling a bit fancy with presentation when I took this photo. Ziti with Brasciole-Inspired Tomato Sauce is topped off with some toasted, crunchy breadcrumbs, which are a simple yet amazing addition. The sauce is full of garlic, and golden raisins give it a tart bite. 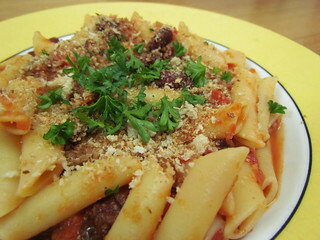 I added some kidney beans, and only used 8oz of ziti instead of 12oz. When I first got my new phone (a while ago now), of course I had to play with the different filters on the camera. Here Dim Sim is modelling one of them for me. This year was the first time in three years I had a chance to celebrate winter solstice. In 2011 and 2013 I was in the US, so I got to have an extra summer solstice, and in 2012 I was studying for some major exams, so I wasn't paying attention to anything else. Food is central to every celebration for me, so I marked the night by cooking a big dinner for my family and a friend. I chose the 'Christmas' menu from Party Vegan. 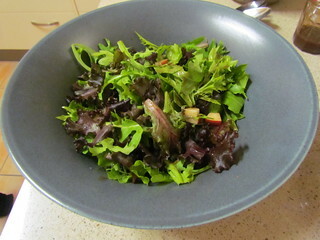 Mixed Greens with Caramelized Walnuts and Balsamic-Pear Vinaigrette is an fresh start to the meal. I used a 150g salad bag of mixed greens, which used half of the dressing. The dressing in question is a blended pear and vinegar concoction - very nice! Caramelized walnuts and sun-dried tomatoes are nice add-ins. I used some rehydrated sun-dried tomatoes instead of oil-packed. 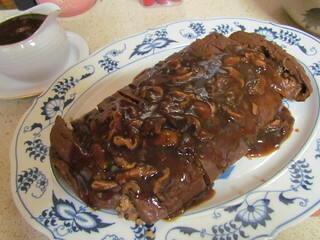 Porcini-Stuffed Seitan is the impressive centerpiece of this menu. It is amazing!! 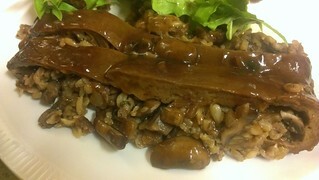 The stuffing made a bit more than I could fit into the seitan, but not by much and leftover stuffing is always great. I used cremini rather than white mushrooms in the stuffy, because that is what I had. The seitan roll was quite flat, but that didn't affect the taste. I took the suggestion to make the roll in advance so I could cook it, then slice it (it slices better cold than hot), then I wrapped it all up in alfoil and reheated at 180dC for one hour to reheat. 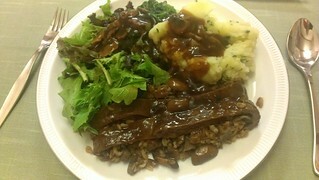 It is served with a delicious brown mushroom sauce, which is amazing poured all over the sides as well. 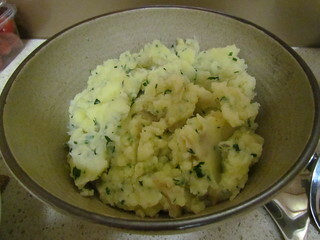 Herb-Mashed Potato fulfills the potato requirement for all holiday dinners. This creamy mash is studded with fresh chives, parsley and tarragon. 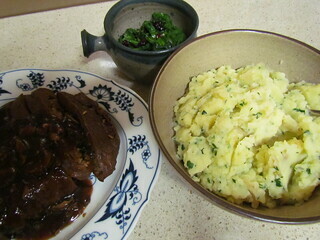 I left the skins on the potatoes because I am lazy and I don't mind some texture in my mash. 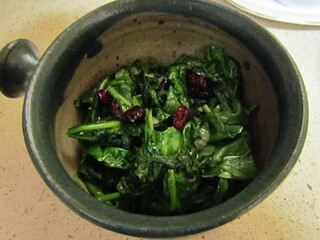 Wilted Baby Spinach with Dried Cranberries comes together very quickly. I only made a half batch, which made a small amount so definitely make the full recipe. Let's have a look at it all together! Spiced Two-Apple Tart with Cider Creme brings it home in spectacular style. 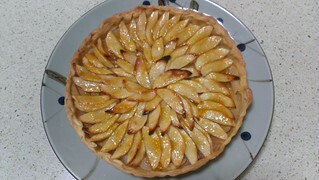 I was quite taken with how pretty this tart looked, especially as I am trying to get better at pastry. I didn't need to use all the water in the pastry to get a good dough. I used a total of 5 apples rather than 6 to cover the tart, and I brushed the finished tart with apricot jam as apple jelly could not be found anywhere. I used juice rather than cider for the creme (as the only apple cider available here is bubbly and alcoholic), which had a lovely taste. 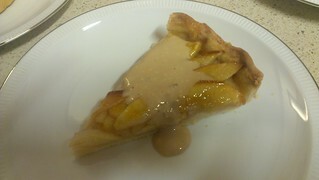 I had to chill the creme in the fridge for a while to thicken it up enough, though you can see it was still quite runny. I used a 9-inch fluted tart pan. - Saturday evening: Finish everything and eat! As I mentioned, Petunia has a home now. I miss her, but I am so glad she now has a place and a family to call her own. 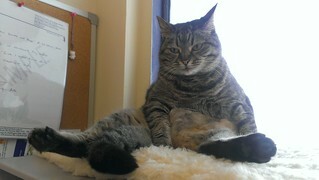 Petunia is the master of pretty poses, but she can also do an impressive funny pose.